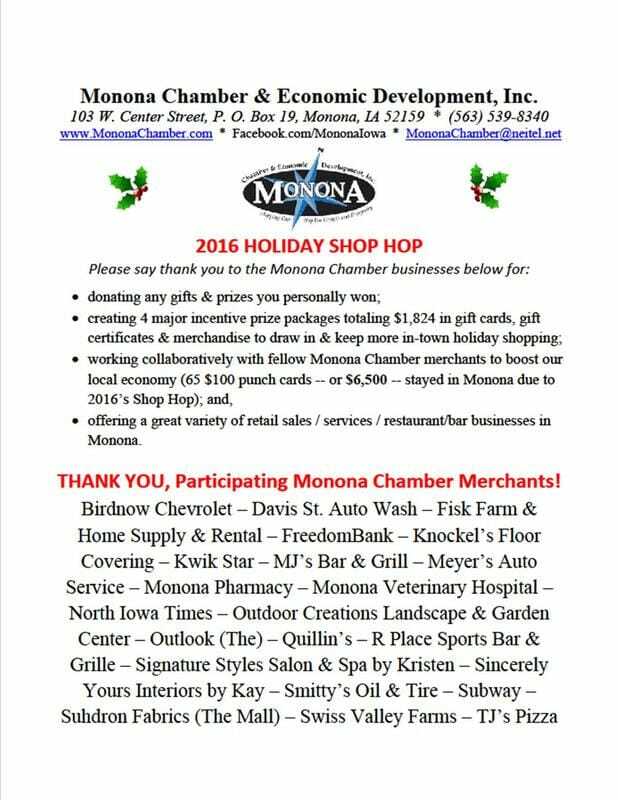 2016 WINTER / Holiday Shop Hop Featuring Retail & Specialty Shops, Service Centers, Dining & Entertainment (12/3/16 - 12/24/16) - Monona Chamber & Economic Development, Inc.
Press PLAY below to hear Monona Shop Hop's KCTN radio ad. Thanks to Monona Chamber member KCTN for its extra help! Monona's HOLIDAY SHOP HOP with PUNCH CARD game runs for 3 full weeks & 4 full weekends of gift / holiday / personal shopping, dining & entertainment before Christmas Day. Check out Monona Chamber's website to find a particular store, service, or item on your shopping list -- or -- find some great food, family or adult fun & live entertainment to relax you after shopping. ​Need help? Call Monona Chamber 563-880-9190. Win 1 of 4 Packages of Gifts & Prizes Valued >$1,000: Generous Monona Chamber merchants donated $1,000+ in prizes & gifts that filled up four large baskets & 1 of them could be yours! 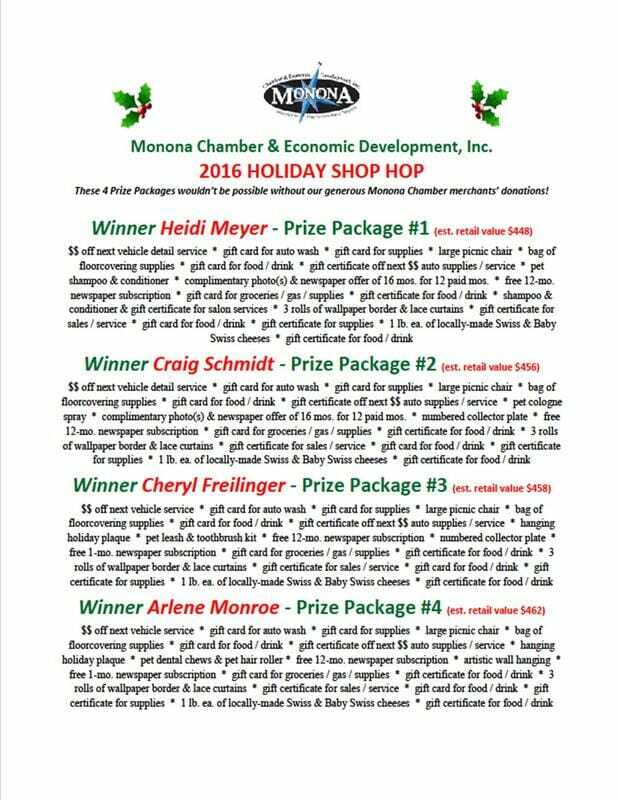 Drawing & Eligibility Rules: Anyone will become eligible to win 1 package of gifts & prizes when they fill in their Shop Hop PUNCH CARD between Dec. 3 - 24 with purchases from at least 3 different participating chamber merchants found on Monona Chamber’s website or the links below. Merchant will validate PUNCH CARD for the amount purchased in $5 increments. After shopping, sign your name & email & phone to the PUNCH CARD & drop it off any time 24/7 at Monona Chamber by the Christmas Eve 11:59 p.m. deadline. Only one PUNCH CARD per person, please. Any child winner under 18 years old shall be accompanied by his / her parent or guardian to pick up the package of gifts & prizes. 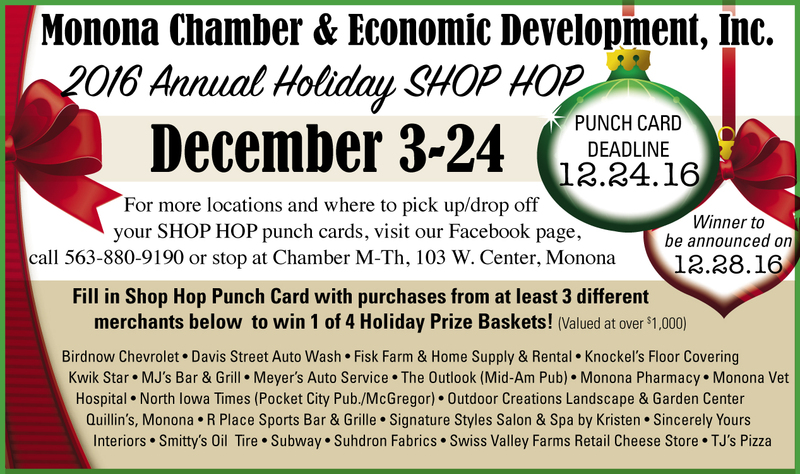 Where to Pick Up Your Punch Card: Starting Dec. 3 - 24, each participating Monona Chamber merchant location will have a stock of PUNCH CARD for pick up during regular business hours. The following locations will have an extra stock of PUNCH CARDs: Monona Chamber ~ Monona City Hall ~ Birdnow Chevrolet ~ Fisk Farm & Home Supply & Rental ~ FreedomBank ~ Kwik Star ~ MJ's Bar & Grill ~ Monona Pharmacy ~ Outdoor Creations Landscape & Garden Center ~ Quillin's ~ R Place Sports Bar & Grille ~ Subway ~ Suhdron Fabrics ~ TJ's Pizza. Questions? Call chamber 563-880-9190. Deadline & Where to Submit Your Punch Card: Fill in your name and contact phone number on your completed PUNCH CARD and drop it off any time prior to Sat., Dec. 24 @ 11:59 p.m. ONLY at Monona Chamber at 103 W. Center St. (SWC Center & Main in downtown Monona). 24/7 after-hours PUNCH CARD drop offs may be made by dropping finished / eligible card through Monona Chamber's front door mail slot . . . and it goes right into drawing bucket! Remember: $.69 of ea. $1 spent stays locally in Monona & circulates 7 times over: COMMIT TO SHOP SMALL. SHOP MONONA. Grab your friends & family & have tons of fun & enjoyment over the next few weekends with shopping & other activities in Monona (e.g. hiking butterfly trails, all-inclusive playground, historical museum, etc.). Your friends & neighbors run small local businesses & small non-profit organizations, so help give them & our local economy a boost! Best of Luck! !